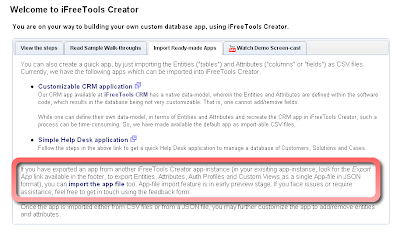 Creating an online database application using iFreeTools Creator is as easy as defining your entities, attributes and to start using it adding the users. While this allows you to create a basic database app, you can further customize it as per your requirements including by creating custom views, custom actions, authorization profiles, etc.,. And at some point you might want to create a duplication application -- may be for testing new features (which we keep rolling in based on suggestions from users) before you start using them in your main production application instance or may be to move on to your own single-tenant deployment, over your Google App Engine account. This is easy to an extent, with regard to exporting and importing Custom Entities and All Attributes as CSV files. 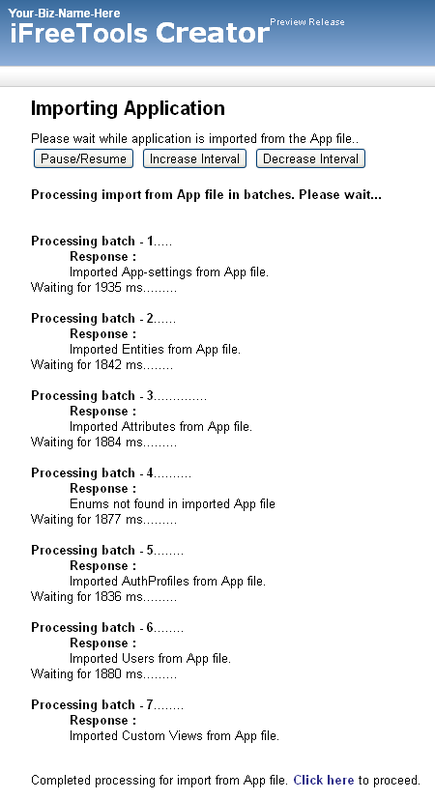 But, when you would like to have your additional configurations like Custom Views, Custom Actions or fine-grained Auth Profiles which you have created for your users, then the only option until now was to re-create them manually after importing the basic data-model as entities and attributes, as these configurations did not support export / import option. Not any more. We have now made it possible for admin users to export the application as a single application file which apart from containing the Entities and Attributes details will also have the configuration details of App Settings (including re-branded app-names, logo images, time-zones, etc.,. ), Custom Views and Custom Actions (both shared and user-specific), Auth Profiles and Users data. Technical note : In case you are more technically inclined, the app-file is in JSON format, which you can open with a normal text editor, like notepad and view the contents. 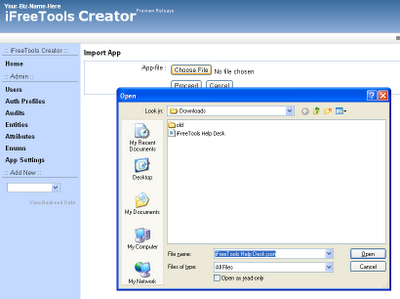 For admin users, the Export App link will be available in the footer. 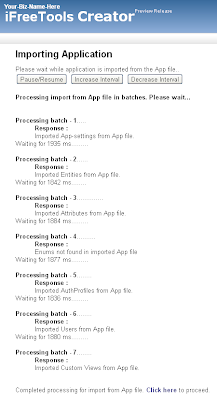 Once you export this application, save this file to your computer and then proceed to your new application instance. You can create new ones from under My Apps (link in the top-right and in the footer). In the new application's home page you will find the option to import the app-file under the Import Ready-made Apps tabs. Clicking on the import the app file link will take you to a page where you can specify the app file to be imported. 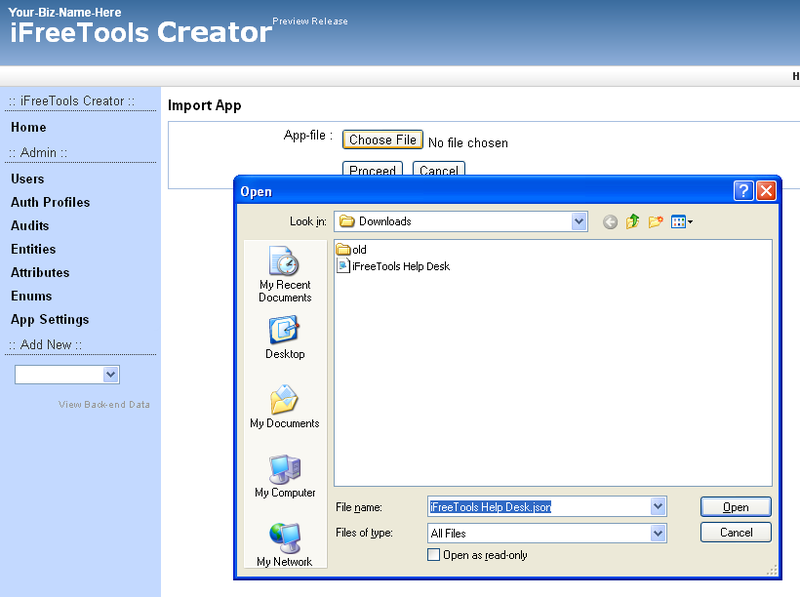 Browse and select the application file which you had exported earlier and click proceed. 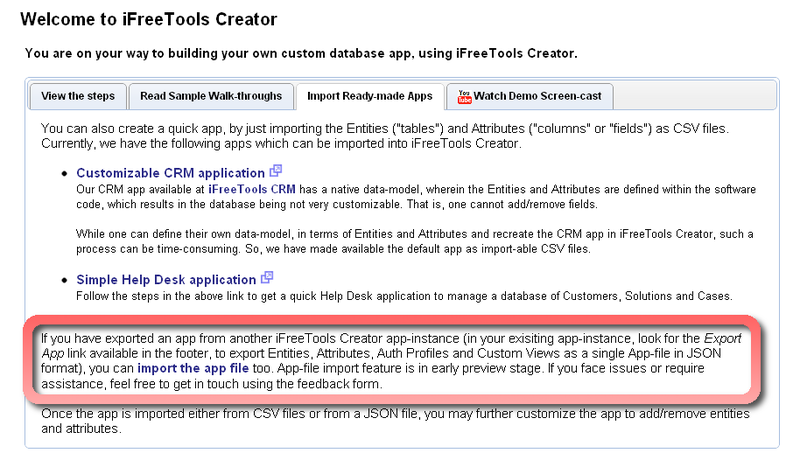 iFreeTools Creator will now process the contents of the app-file, to automatically re-create you database application. That is it ! Now you have a duplication application ready to use. Hope you find the new feature useful. Do keep sending in your suggestions on how we can make your online database application better and easier for you.